Walnut is relatively widely distributed across the eastern and central sections of North America, and so quite common in most manufacturers' lineup of wood flooring options. It is the only North American naturally dark-coloured wood... thus the colour goes right through the wood and minor scratches are easily fixed up without having to play with stains. Dimensional Stability: Much like cherry it is very stable and an easy wood to cut, sand and finish. 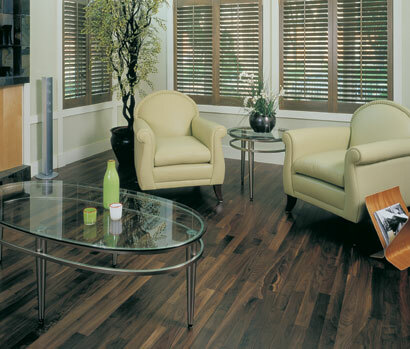 Durability: Walnut is softer then traditional North American hardwoods, so life should be a little gentler on this floor to maintain a nice finish and avoid dings and dents. Colour variation: There can be dramatic colour differences between boards. The sap wood is almost white and the heart retains the traditional dark brown shades with almost a purplish overtone. Usually the higher the grade the higher the percentage of heart stock, but make sure you understand what to expect.... Some customers have got a rude surprise by the number of light boards and the overall variance in colour once the floor was laid. If you try and remove all the sap boards when installing the floor you may find your wastage factor is unacceptably high. Colour change: Walnut is already quite a dark wood, thus colour change on exposure to sunlight is rarely considered. Some fading can be expected in strong sunlight. Indentation: Walnut, like cherry does dent relatively easily, as you would expect when comparing the Janka rating, thus it is best in more lightly used environments if scratch marks are going to bother you.